MIDDLESEX, N.J. (CNS) — Father Carlos Martins preaches that for Catholics to reach heaven, they must possess forgiving hearts, participate in the sacraments and live their Christian identities to the fullest. The priest, a member of the Companions of the Cross community, travels around the United States and beyond speaking about the faith, and — perhaps more importantly — providing people with tangible evidence to pursue their devotion in the exposition and veneration of sacred relics. On a Saturday afternoon in March, Father Martins visited Our Lady of Mount Virgin Church in Middlesex to speak and host a special exposition, “Treasures of the Church.” With more than 150 relics in an A-Z list — from St. Agnes to St. Zelle Guerin, the mother of St. Therese of Lisieux — the unique collection also included relics of well-known saints such as St. Maria Goretti, St. Francis of Assisi and St. Thomas Aquinas. As Father Martins’ presentation made clear, the experience was unlike anything that most attendees had witnessed. While non-Catholics might find the veneration of relics unusual or even strange, it is solidly rooted in Scripture and an important tradition of the Catholic Church, the priest explained during a 60-minute presentation before the exposition. Saints and their relics are not worshipped, but honored in a manner that acknowledges God’s work in their lives, he said. Before the estimated 500 people ventured from the sanctuary to the church hall to take in the relics, Father Martins instructed them on how to proceed. And that’s what people did. Fifteen tables held relics and brief descriptions of the saints. Attendees walked around the tables mostly quiet, and clutching medals and other items, touching them to the relics. Besides the relic tables, the “Treasures” featured the mother lode of the exposition: a large piece of the cross of Jesus Christ; a piece of fabric from Mary’s veil; a piece of thorn from Christ’s crown of thorns and more. 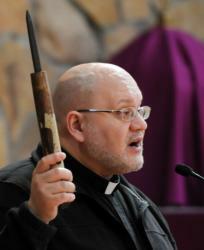 Father Martins said he has seen God’s work through the relics of the saints — sometimes in surprisingly healing ways. The Lacey family of Haddon Heights can attest to this. 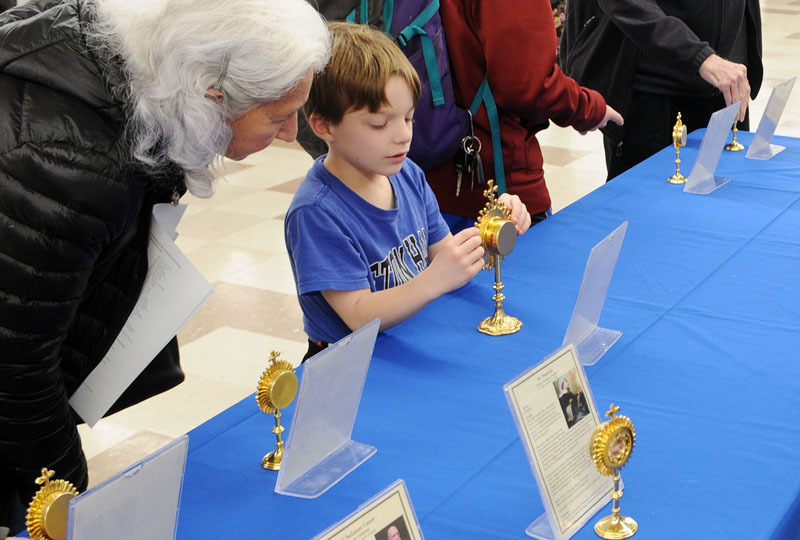 Charlie and Cathy Lacey attended a “Treasures” exposition two years ago at St. Agnes Parish in Clark, with their family, including sons, Brendan, 15, and Patrick, 13, both of whom they said were cured from health-related issues, thanks to the relics. Patrick was healed of cerebral palsy, the couple said, while Brendan has been cured of eosinophilic esophagitis, a chronic immune system disease that has only been identified in the last two decades, according to the Mayo Clinic website. “The healings come from God through the relics,” Cathy Lacey told The Catholic Spirit, newspaper of the Diocese of Metuchen. The family attended the March 16 event in gratitude to Father Martins, thankful for the miracle of two family cures and willing to share their news. Among those in attendance were members of Our Lady of Mount Virgin Parish, including Bud Crede. Asked if he believed passing by the religious artifacts might get him closer to heaven, Crede smiled. Blair Breen added, “I love this, because … I really love the saints.” As she spoke, her little sister Nora passed by the tables, picking up relics from their holders like a happy child who has found a lost toy. Ester Chung of Englewood Cliffs, New Jersey, who came with her family, also called it “amazing” to see the number of relics in one location, along with the cross of Christ and veil of Mary. “I know the relics do God’s work, and I just wanted to share the works of God with my son,” Chung said, She said her 7-year-old child, William Nam, has been diagnosed with autism since he was 2, and she was seeking a saint’s intervention to help cure him. Bob Favocci, of Nazareth, Pennsylvania, who came with a contingent that included his two daughters and others, said the chance at a “personal encounter” with the saints prompted him to make the trip. “When you see a collection of this concentration, it kind of shakes you down to your core,” said Favocci, who works in Bridgewater. You realize you’re part of a great heritage. “We’re called to sanctity. We’re called to sainthood,” Father Skoblow said. “What better way of approaching God and praying for holiness than to experience the holiness of those who’ve gone before us. Father Martins, 44, who said he was an atheist before he joined the Catholic Church while in college, said he has felt blessed by all the goodwill and healings via the relics. Father Martins also encouraged the faithful to contact him about any experiences, with the most dramatic effect he believes comes from the exposition is the healing within the human soul. Salamone writes for The Catholic Spirit, newspaper of the Diocese of Metuchen.